Recent Results in Cancer Research: Bone Mineral Metabolism in Cancer presents the clinical approach to bone tissue metabolism, which depends on studying the plasma state, renal handling, kinetics, and balance of calcium and inorganic phosphate. 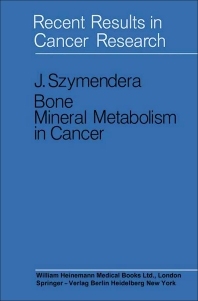 This book discusses the problems of bone mineral metabolism in patients with cancer. Organized into five chapters, this book begins with an overview of the two major phases of bone mineral, namely, amorphous calcium phosphate and crystalline bone apatite. This text then examines the plasma state and renal handling of calcium and inorganic phosphate under controlled metabolic conditions. Other chapters consider the variability of each parameter in the majority of patients without bone secondaries. This book discusses as well the normal remodeling of bone in fertile-age women. The final chapter deals with the plasma state, renal handling, and kinetics of calcium and phosphate in plasmacytoma patients. This book is a valuable resource for oncologists.